For $2 per page, our designers will organize your content into formatted, reader-friendly layouts. Level 1 Page Design encompasses the most common features of interior book design. This level is for authors with largely text-driven content who want to deliver a clear, straightforward message with their books. Genres that commonly fall into this	category include fiction, simple memoirs, life stories, family histories and novels. Our designers will work with you to help determine what level of interior page design is right for your project. Additional design services are available for charts, graphs, tables, logos, line art and more! Make sure to talk to your designer if you are interested in these features. Level 1 Interior Page Design ensures that the most essential elements of book design receive a professional touch, creating a layout that is both beautiful and practical. Basic elements, such as proper typography and spacing, provide the backbone to your interior page design, enabling your readers to approach and appreciate your hard-written words. 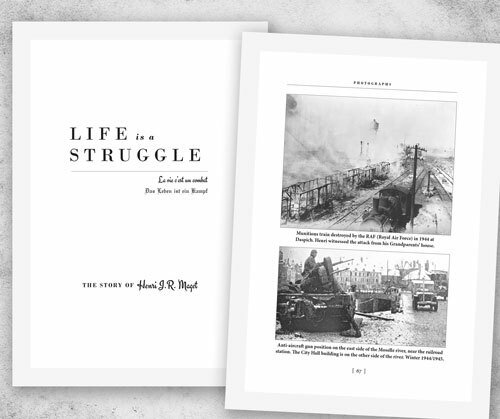 The front door of the interior pages, the title page sets the stage for the entirety of your book. Typography, sizing and spacing are crucial choices that will establish a tone for all the content that follows. Our designers guarantee that your book stays beautiful from the first page to the last. 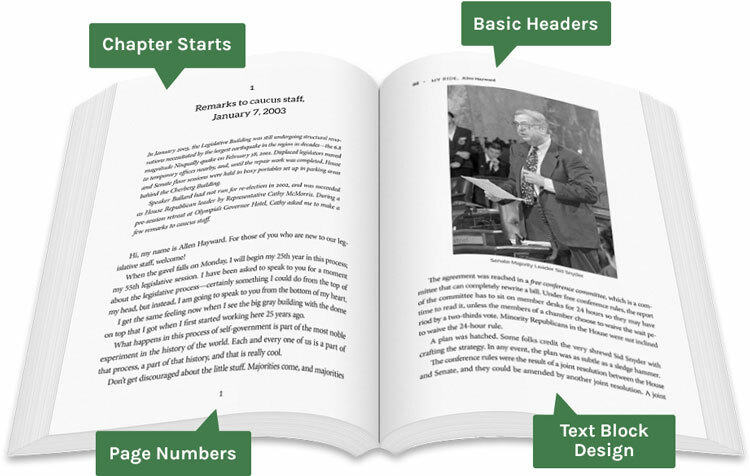 Headers (words at the top of the page above the text block) help provide a foundation and give your book that published look. Basic headers are structured with the authors name on the left page (verso) and the book title on the right page (recto). The traditions of hundreds of years of book design have resulted in a myriad of rules for hyphenation, spacing, leading and justification. Don't stress the little things! Our designers carefully address each one of these details, allowing you to focus on what matters: your writing. The copyright and dedication are two common pages to appear before the body of your book (also called 'front matter'). Having the proper copyright information can protect your ideas, words and images and prevents unauthorized resellers from copying	and selling your work, securing your earnings as an author. Good design is often invisible. An often overlooked element, the size and placement of your page numbers have a big	effect on the quality of your text layout. Our designers know exactly when (and when not) to position page numbers for to create an interior design that is both seamless and impactful. Whether you're establishing a scene or picking up from a gripping cliffhanger, chapter starts serve as important checkmarks for any book. Making the type larger or more decorative gives your page flavor and creates a cohesive style between your interor and cover. We carefully consider the alignment, spacing and vertical placement of your chapter starts for maximum effect. While you want your readers to get lost in your story, you don't want them getting lost in your book. 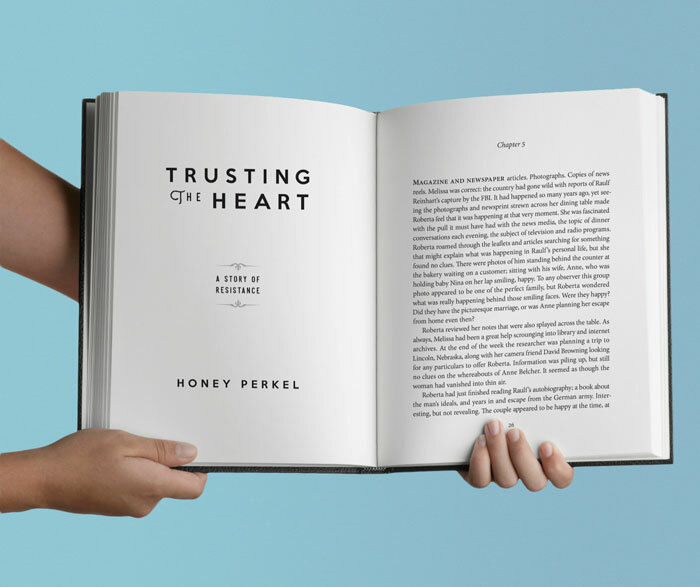 Previously known as a “table," the contents page allows your reader to view your book's inner workings at a glance. Proper design of your contents page provides a map for your readers and peaks the interest of your point-of-sale buyers. 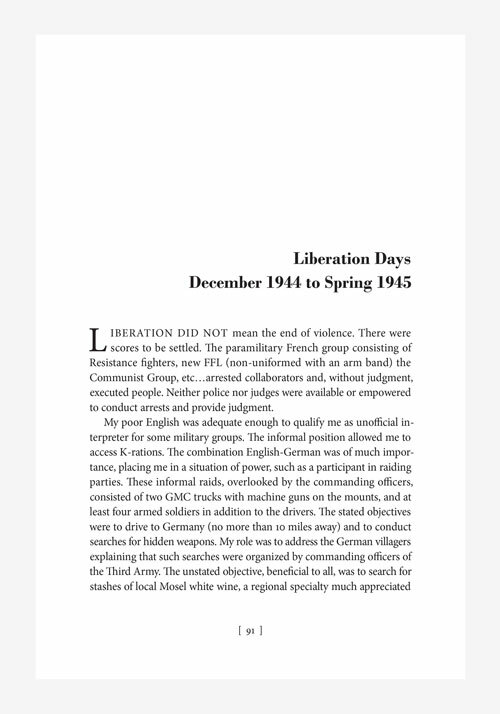 A contents page is essential for any book except those that contain only numbered chapters and no chapter titles.